My wonderful “Time Takers” – Go ask Alisa – DIY capsule wardrobe one stitch at a time! How many times is it possible to start everything from a scratch, from zero, to begin your life road at this empty point A and burn bridges behind you? A friend, true and dear one, once told me that you can start everything from a fresh beginning if you never look back. Once you never go back on your promises, once you never doubt yourself for decisions you made. Once you have left everything and everyone behind. I do agree. You may regret what you have done but don’t look back thinking what “if”. What you might be afraid of could never happen, so do not burden your life, don’t drag clutter from the past into your new life. Leave everything behind, everything… but your friends. Here I am. My life starts from a complete zero and slowly picks up in a speed of its movement. It always starts low and works its way up, it will always be empty at the beginning and you will see how it transforms into the splendid feast of life. I am starting a new beginning, and I am taking my friends with me, for sure! My friends, wonderful people, are most definitely the best and I am sorry I might not have had enough of time to tell you that. They say that we tend to remember friends when we’re in trouble and in need for help. Not true. Yes, times are rough and I am on the edge, but it is not the reason. I just finally have the time to stop and think, breathe and realize what amazing people I am surrounded by. So friends, I am sorry for this intimidating and a bit embarrassing “Love Letter” but I think you all deserve it. I am thankful for all the moments of joy and sadness, I am happy that I was there to help you and you were there for me when I needed you the most. With some of you I share my passion for art, with some interest for movies or dressing up, with some I can talk when there is something on my heart, or maybe talk just about nothing. And foolish is that person who thinks that friendship should come with no extra work and dedication. Friendship as any other relationship is a hard work, time taking process. Oh, and you all know the best how much do I hate running out of time! Quite a while ago I was reading a book about life and doings of one of the greatest philosophers or previous centuries. he valued his friends a lot, but his main concern was that his friends, by becoming too big of a part of his life, would take over his time. Time, that he valued so highly; since he had only 24 hours a day to create, write it down and possibly engrave it in minds of others to pass the wisdom to the next. He called his friends “time wasters”. Not in a bad or ugly way, not at all. At first I thought so, I was angry and lacked any understanding of what was behind the “time waster” label. He was simply stating that real, honest, true and radiant, glowing friendship takes time and effort, it is hard work for both, you shall give a lot. A lot of things that if gone, then gone for good. Some of the most valuable pieces that we have, one of them is – time. Those hours spend in conversations, phone calls, writing letters, sending post cards or simple texts. Those days when you sip your precious Earl Grey and indulge with even more precious Friend. When you share everything, the good and the bad. My mother also once told me that I will know a real friend not when I need him or her the most in the time of trouble or difficulties, but in the moments of pure happiness and comfort. It is rather easy to be sorry and be sympathetic to someone who needs your helping hand, when you’re on the top and someone is falling low it is rather rewarding feeling. But when you need to be truly happy for someone: without envy, back thoughts, or any other ugliness, that is the challenge. Know your friends in the moment of happiness! I am so sorry and angry on myself that I never let myself to unleash my friendship emotions and qualities. Partly because I was raised that way, partly because openly expressing your emotions is twice as hard then pouring them over a piece of paper or a computer screen. I had many chances to start with myself, to cultivate my personality and fix the missteps, but I never finished or even gave a dead-line to the biggest project of my life. I promise I will work on it. I appreciate every single one of you, I admire your personalities, you make me stronger, you help me develop, you are one of the true values of my life – my Wonderful Time Takers! I am glad you have such wonderful friends and took the time to thank them. I’m sure they appreciate you too! Thank you, but it is mostly about not having the time in the past and actually thanking them now, still hoping that the dead-line for saying “thank you” has not passed. Yep, I try to not to think about it (cause I am a huge optimist), but life is a split moment and with every new day You never know what will happen. 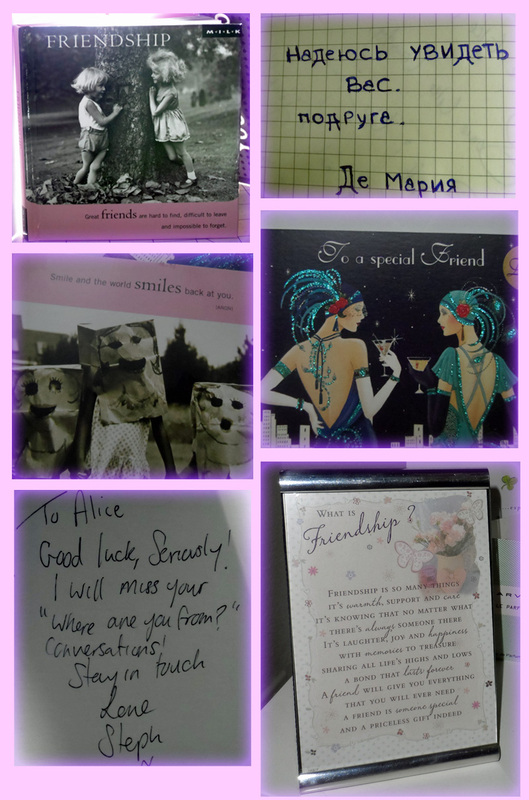 So I choose to do things in time, thanking my friends is one of them! 🙂 Glad you enjoyed!